This book discusses the issues involved in cooperative networking, namely, bottleneck resource management, resource utilization, servers and content, security, and so on. In addition, the authors address instances of cooperation in nature which actively encourage the development of cooperation in telecommunication networks. 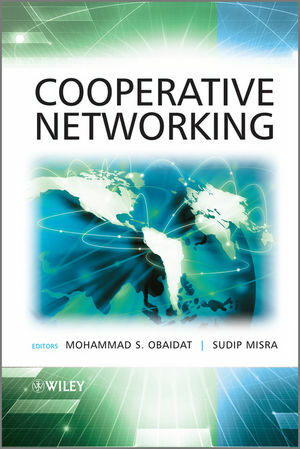 Following an introduction to the fundamentals and issues surrounding cooperative networking, the book addresses models of cooperation, inspirations of successful cooperation from nature and society, cooperation in networking (for e.g. Peer-to-Peer, wireless ad-hoc and sensor, client-server, and autonomous vehicular networks), cooperation and ambient networking, cooperative caching, cooperative networking for streaming media content, optimal node-task allocation, heterogeneity issues in cooperative networking, cooperative search in networks, and security and privacy issues with cooperative networking. It contains contributions from high profile researchers and is edited by leading experts in this field. This book is an ideal reference for researchers and practitioners working in the field. It will also serve as an excellent textbook for graduate and senior undergraduate courses in computer science, computer engineering, electrical engineering, software engineering, and information engineering and science. Mohammad Obaidat received his Ph.D. and M. S. degrees in Computer Engineering with a minor in Computer Science from The Ohio State University, Columbus, Ohio, USA. Dr. Obaidat is currently a full Professor of Computer Science at Monmouth University, NJ, USA. His research interests are: wireless communications and networks, pervasive computing, networking and communications, modeling and simulation, performance evaluation of computer systems, and telecommunications systems, security of computer and network systems, high performance computing/computers, applied neural networks and pattern recognition, security of e-based systems, and speech processing. Sudip Misra is an Assistant Professor in the School of Information Technology at the Indian Institute of Technology Kharagpur, India, and is also an Adjunct Professor in the Department of Computer Science at Ryerson University, Toronto, Canada. He received his Ph.D. degree in Computer Science from Carleton University, in Ottawa, Canada, and the masters and bachelor's degrees respectively from the University of New Brunswick, Fredericton, Canada, and the Indian Institute of Technology, Kharagpur, India. His current research interests include algorithm design and engineering for telecommunication networks, software engineering for telecommunication applications, and computational intelligence and soft computing applications in telecommunications. Cooperative Networking Visit the accompanying website to access PowerPoint slides and a glossary of terms.